I wonder if putting this picture on Facebook would get me banned? 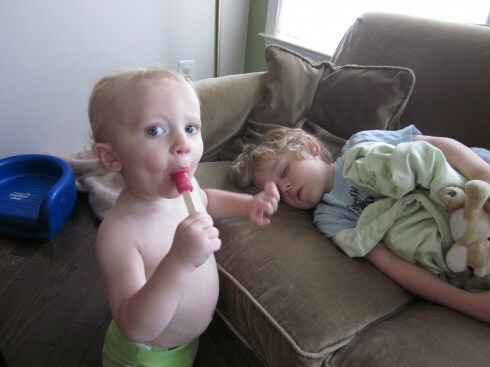 Also, I wonder if mothers of twins may be able to especially relate to this picture of udder (sorry – had to) exhaustion? 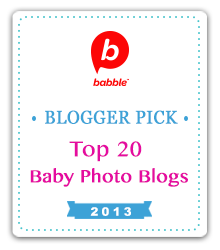 Because I only had one baby at a time and I surely looked like this on many an occasion. Well, okay, maybe I didn’t nurse while wearing a five-point harness. For safety and all. Breastfeeding women of the world, we salute you. Nursing and napping…together at last. ‘Tis the season for tots to warm the cockles of our hearts with their adorable footies and their vigils for Santa. Who can resist the determination of the wee ones to stay up late, peeking out the window and watching for Santa? 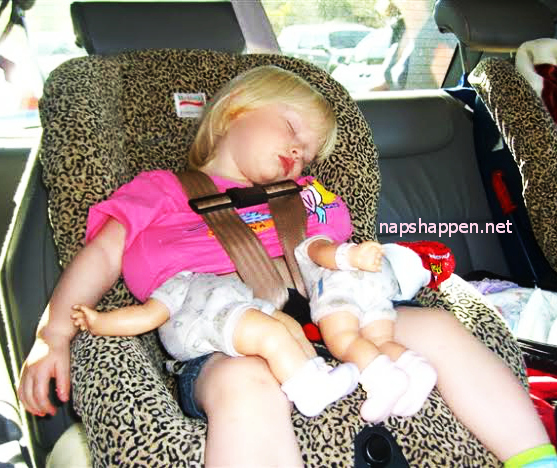 On the seventh day of Christmas, my true love gave to me…an awkward sleeper in a footieeeeee. It may have taken this little dude awhile to crash, but he didn’t give up, even at the last moment. I like the Nestea Plunge positioning. Now that’s a fine-looking plank position! Quick – go wrap some gifts! If you’re landing at Naps Happen for the first time, the sheer number of dreamy snoozes in here can get overwhelming. 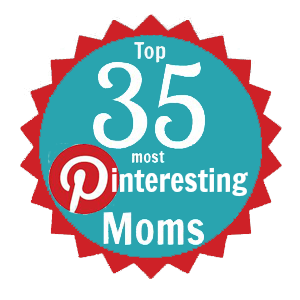 You can just scroll down and start clicking, or you can sample a few of my favorites to get started. 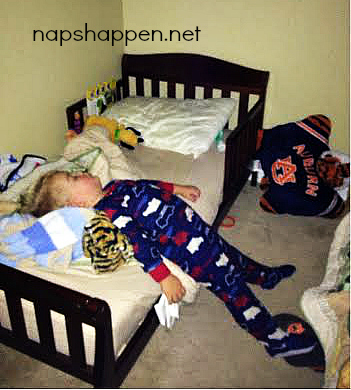 Naps that seem like they couldn’t have possibly happened! Naps with man’s best friend! Naps amid screaming day campers on wet tile! I’m sorry…I’m feeling sleepy and I need to take a break. Make yourselves welcome and come back to see us again! I am busy cooking for Thanksgiving today, so I thought I would share with you one of my absolute favorite recipes! I got it from my magical (as in creator of magically delicious cooking) Aunt Brenda, who got it from her sister-in-law Kieran. All I can say is, THANK YOU KIERAN. This dish is so easy and you can prep it the day before. If you have a lot of people, just double the recipe and use a large, rectangular dish. Then watch them scrape the dish clean, people. 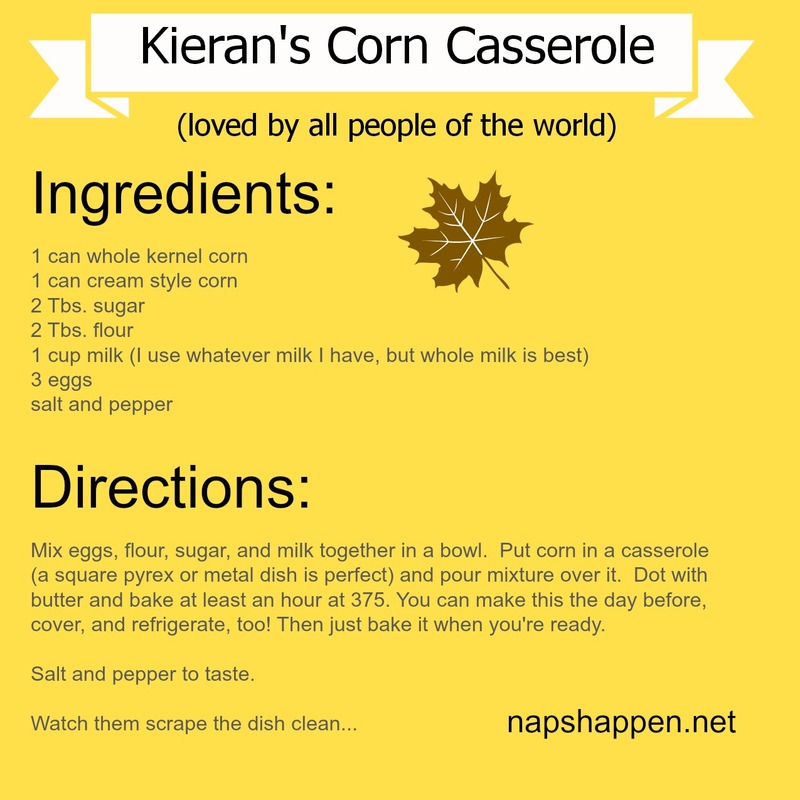 If you need a corn recipe, give it a try! We at Naps Happen are wishing each and every one of you a happy, safe, and yummy Thanksgiving! May you enjoy lovely after-dinner snoozes.